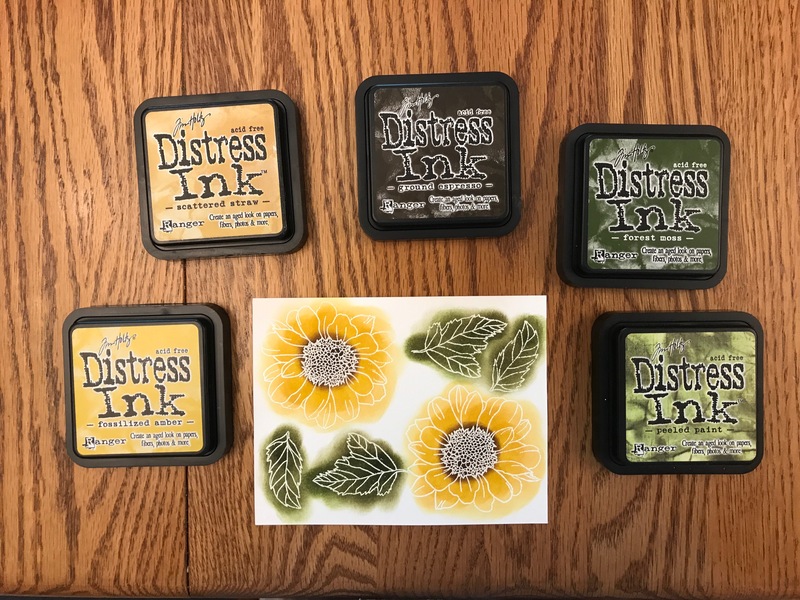 As Natasha of The Artisan Life points out in The Joy of Snail Mail & Decorated Envelopes DIYS, there’s something special about receiving snail mail. It was with this thought in mind, and the prospect of Mother’s Day around the corner, that I decided to make a card for my mother-in-law. She loves flowers, so I knew that whatever I created, it would incorporate one. I also wanted to experiment with a new technique, so I turned to my favorite card crafter, Jennifer McGuire. This past week she released a video tutorial, Tulle Shaker Cards, about how to create shaker cards using tulle. Your usual shaker card sandwiches sequins and beads between two layers of acetate, but Jennifer suggested using tulle instead. Tulle can be purchased economically in the bridal section of a fabric store; I purchased a yard for $1.49 that will be good for dozens of cards. You can also go to Michael’s bridal section and purchase a six-inch-wide roll of tulle for $2.99; the roll holds 20 yards. Tulle allows a card to lie flat, making it easy and lightweight to send in the mail. I began my project by cutting my card stock to size, cutting scalloped circle windows into the note card and card front. Using Scor-tape, I applied double-sided adhesive around the circle openings, and overlaid that with a square of tulle. Then I dropped my sequins into the center of the tulle, and used Scor-tape once more to adhere the front of the note card to the note card itself. 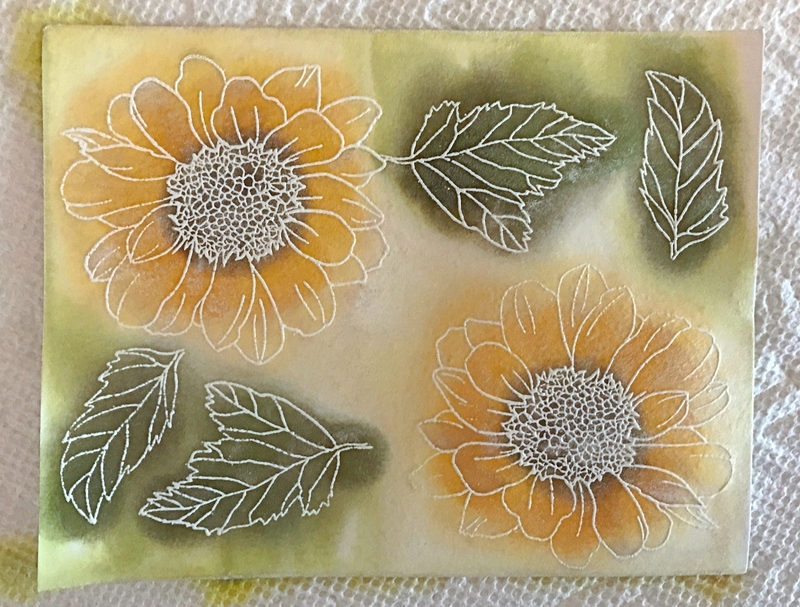 Next, I stamped the daisy-and-leaf images with clear embossing ink, dusting the ink with white embossing powder, and then heat setting it. Using sponge daubers, I colored in the images with Tim Holtz Distress inks. I sprayed the images generously with Tattered Angels Glimmer Mist to produce a pearlized sheen. As Jennifer McGuire points out, you can create your own glimmer mist with Perfect Pearls powder and water, but I used what I already had on hand. I was in a hurry, so I dried the wet, not-so-attractive concoction with a heat gun. Once the paper was dry, the flowers and leaves looked a lot better. I did not have dies for cutting out the images, so I fussy cut them with scissors. The trick to fussy cutting is not to turn the scissors, but to turn the paper as you cut. 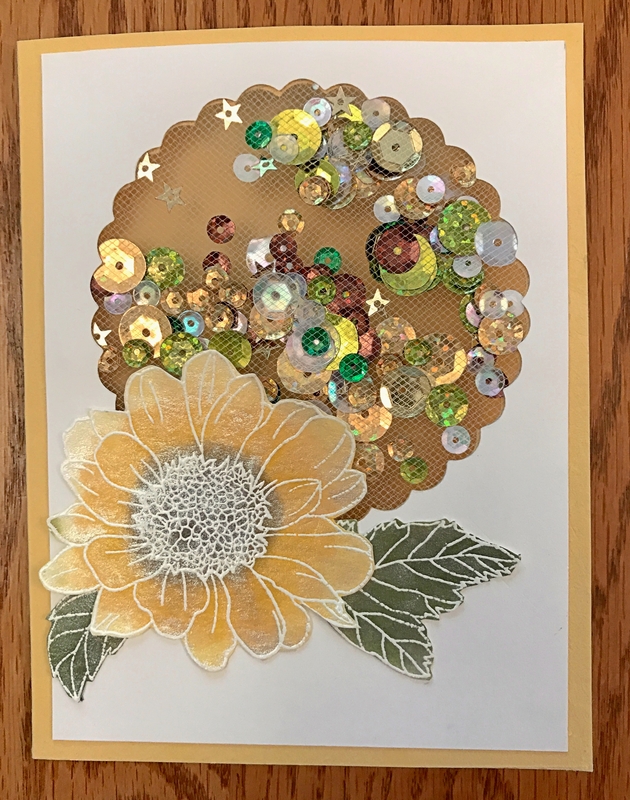 I used Scor-tape to adhere the flower to the front of the card. The last thing I did was stamp “Happy Mother’s Day” on the inside of the card. Initially I was going to emboss these words in black ink, but I changed my mind and used clear embossing ink instead. When you heat set clear embossing ink, it gives you a tone-on-tone look. 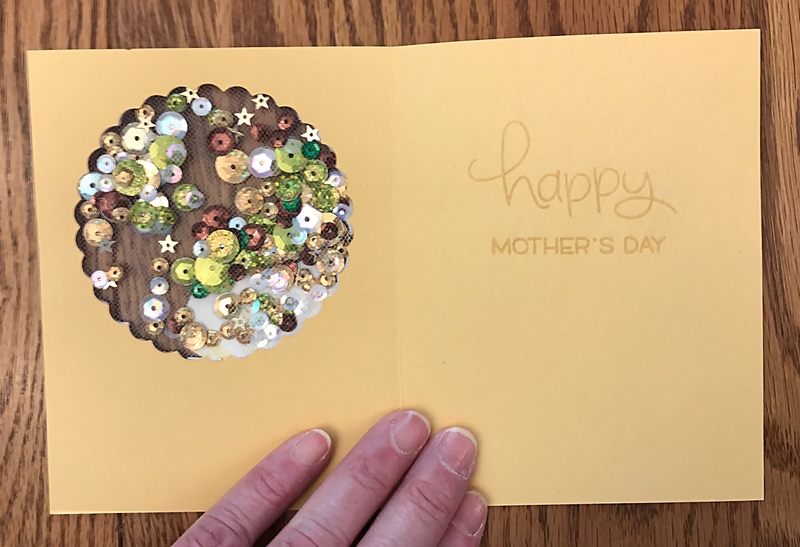 Crafting a card like this takes only an afternoon, and you can probably make more than one if you organize your work assembly-style. Working with tulle was easy and fun; I suspect I’ll use this technique again. Thank you, Jennifer McGuire, for your crafting inspiration! What a fun card! Your mother-in-law will be delighted to get this in the mail 🙂 I love making a special card for weddings and graduations as well. I like the use of tulle instead of acetate. I may make a version of this sometime. Thanks for sharing, Judy! I tried to comment the other day, but I think the internet ate my comment (actually, we were having a storm and our internet temporarily went out!). Anyway, this is a very cool card! I can easily imagine some mermaid-y possibilities. =D I’d have to cut the window with my Silhouette, but I am very tempted to try! Your posts have also tempted me to get more dies…I gave in and got a couple of Tim Holtz texture dies the other day.